What will your birds chew on first? The semi-soft mahogany pods? The Shredder strips? The yucca pieces? Maybe the coconut disks or leather pieces? This toy will provide your medium to large birds hours of fun! Standard with stainless steel quicklink. on 3/16" leather lace. This is a great toy for medium-sized parrots. 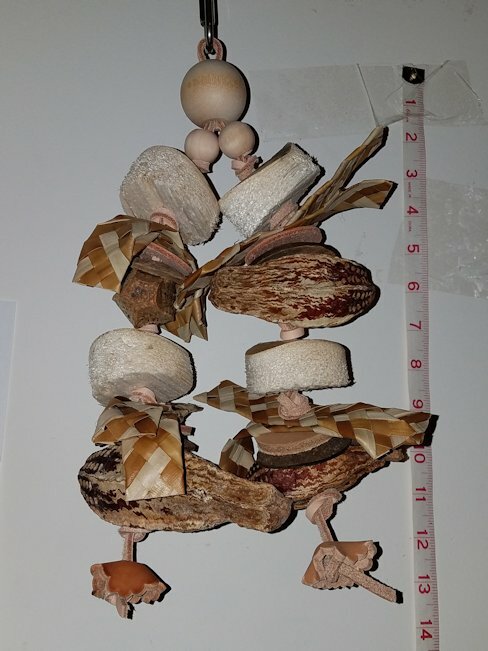 It's got a really great variety of textures, including shreddable palm and soft yucca which are easier, and then the mahogany which is good for chipping, and harder woods like the large beads at the top and the coconut shell. The leather accents are also good for chewing. My parrot really likes this one! I have an African grey and she loved her toy she had fun digging into the leather and wood pieces.